Being a pharmacy student is a lot of work, but a huge part of your education will come not just from studying, but also real world pharmacy experience. How else can you put the skills you learned from school into action? (And also, how else will you get a superb resume to tote around town?) It’s good to know the kind of work you can obtain as a pharmacist, and it’s also good to get out of the classroom to watch pharmacists in action. You can only glean so much about day-to-day life as a pharmacist from your school hours. That being said, the only way you can get the most out of your real world pharmacist experience is by ensuring you already have the knowledge. 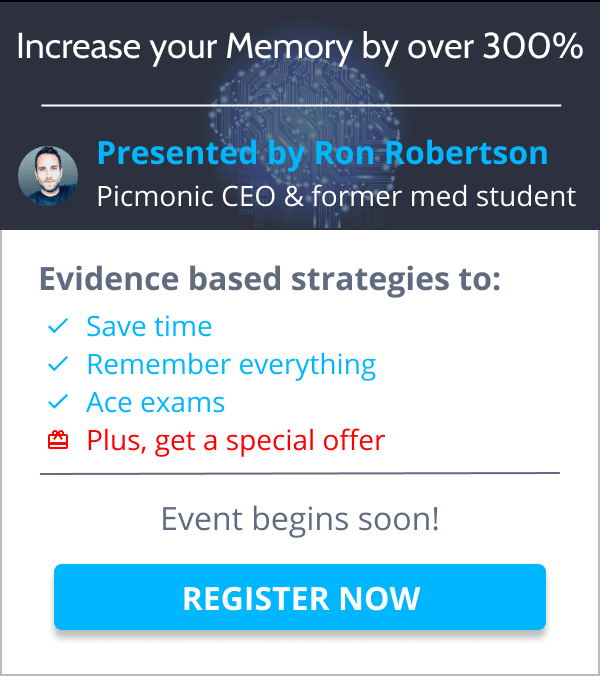 Picmonic’s visual study guides can help give you a brain boost with our spaced repetition approach that helps you remember more even way after you take your final test as a pharmacy student. Like 331% more. Get your free trial of Picmonic today, then take your knowledge to the next level and find yourself an awesome real world experience as a pharmacy student. Not sure where to start? Here are five tips! First off, when you’re excited about a subject or a field, people take notice. You can learn in school and memorize facts but having actual knowledge and a love for something really shows because you tend to take a big interest and work harder to learn naturally (AKA you will be an awesome person to have as an intern). Don’t be afraid to show your enthusiasm! Knowing a lot and being a nerd is totally ‘in’ nowadays, anyway. Let Picmonic help you dive even deeper into the subjects you love! Our mnemonic visual study aids will perk up your grades and your interest with pathways related to the subject you’re studying. Just Ask Someone with Pharmacy Experience! If you’re not seeing the kind of opportunities you’re interested in, make your own! If you know of a program, hospital, or pharmacist that you’d like to work with, call or send an email asking if you can shadow or sit in for a day. Taking initiative is half the battle and chances are that the hospital or pharmacist you contact will be happy to accommodate you. You may be surprised by the awesome experiences you get just because you asked for it! The key to landing a great pharmacy experience outside of school? Actually having a passion for the industry. Working hard to keep up with industry news or getting good grades show that pharmacy school isn’t just this thing you’re doing; it’s your passion and your career. The people who hire you will definitely want to see that you work hard because you love it, not because you have to. But that doesn’t mean you have to love studying. Use Picmonic’s visual study aids to help conquer study boredom. Our stories and characters will help make studying more fun which means you’ll do a lot more of it and in turn, start acing tests and snagging awesome clinical experiences. Observing is great, but don’t be afraid to make yourself useful! Ask if there’s anything you can do to help so you never have a bored moment. It shows you’re curious, willing to work, and dedicated to your craft. Plus, you’ll learn a ton and gain on-the-job pharmacy experience you can’t get in any textbook. What more could you want? Sometimes, you might do everything right but still get a ‘no’ when you ask to shadow or for some clinical experience. Don’t stress over that. You might get 100 ‘No’ answers before you get a single ‘yes.’ That’s totally normal and nothing to be ashamed of. Don’t give up hope! Just put your nose to the grindstone, keep studying, and do your best. If you keep working hard eventually opportunity will knock just for you. It may seem scary to put yourself out there to try to find the pharmacy experience that’s best for you, but don’t be afraid! People are usually happy to help and delighted that you’ve taken such an interest! Taking initiative is half the battle! The other half is making sure you don’t fail out of pharmacy school. Give yourself the best chance by keeping up your grades! Let Picmonic take your learning to the next level with our mnemonic visual study guides that help you remember more come test time. Sign up for your free trial of Picmonic today!